Kenter International Logistics works with a number of experienced customs clearance Australia broker’s who provide a hassle free organised customs clearance service. We manage your shipment through the Australian Customs process as quickly as possible regardless of the mode of transport or type of cargo. We facilitate customs and quarantine clearances for all international imports at all destinations in Australia. 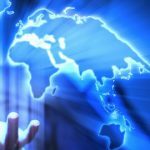 With our extensive global network we can offer consistently high levels of clearance and border management facilitating entry to all areas of the globe, but even better when the origin or destination involves the USA, Australia or NZ in any combination you get to deal with one person the whole way!!!!! No other forwarder in Australia can do this because they don’t own an office in all three of these countries with the owner being an aussie, so they don’t have the same accountability you get when you use Kenter. Our import customs services include the co-ordination and management of clearances with all appropriate agriculture, forestry, government agencies. We can help your business to take control of your imports or exports through Australian borders by streamlining Customs brokerage process. Our team provides prompt and easy Customs clearance through all ports of Australia. Even if you just need some Duty and Taxes guidance. We are available 7 days a week, even on the weekends when most other operators are closed. In Australia there is no requirement for importers (companies or individuals) to hold an import licence, there are Cargo Specific Permits required however from other government departments. So depending on the nature of the goods and regardless of value, importers might need to obtain permits to clear certain imported goods from customs control.Imported goods that may qualify under a free trade agreement for no duty will require a certificate of origin along with clear labelling stating the country of manufacture. The trade description must be marked with the name of the country in which the goods were made or produced, and where specified, a true description of the goods. Further information about trade description goods and ownership of trade marks and copyright can be found under the headings Commerce Trade Descriptions and Intellectual Property Rights on the Department of Border and Immigration website, http://www.border.gov.au/. Vehicles need an import approval issued prior to entry, this includes towable trailers. 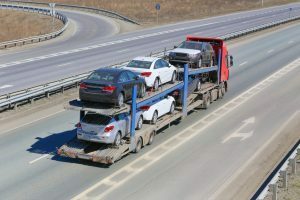 While these permits aren't issued by Australian Customs, it is a requirement in order for the vehicle to be customs released on arrival to the wharf in any Australian port. The Ozone department wants a certificate to show that the aircon unit inside that Excavator cab has been degassed even if it is new, the quarantine department want a fumigation certificate if the container has come from the USA, the destination country of Saudi Arabia wants a certificate of origin signed by their commerce chamber......and the list goes on. Rather than spend hours researching and hoping you got it right, why not just send us an email and have us do it for you ! Accurate Documentation is priority for clearing any goods through any countries borders. 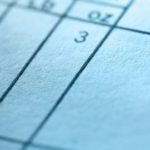 It could be something as simple as your packing depot forgetting to note down the seal numbers that can cause un-necessary delays and charges at origin or destination ports. You can hunt these documents down your self and have lots of back and forth with someone overseas for days, or you can get in touch with us and we'll sort it. need an export permit (regardless of their value). The reason for Export Declarations is to gather export data that we provide to Customs and Border Protection. This is used to ensure that prohibited export goods are not exported and restricted export goods are not exported without appropriate approval. Also this information is also used by the Australian Bureau of Statistics (ABS) to compile international merchandise export statistics. These are then used to make commercial decisions in both public and private sector clients to make trade decisions. Where an exporter has an ABN it should be used on an Export Declaration. This will assist in the verification process when determining the eligibility of the supply as being exempt from GST, along with submitting your Bill of Lading to your accountant as proof cargo has been exported. Importers are required to self-assess their goods, including the tariff classification of their goods. You as the Importer have a legal obligation to correctly assess their goods, and penalties may apply for incorrect or misleading information provided to the Department. Even the Australian Customs Department encourage importers to use the services of a licensed customs broker if they are unsure of how to classify their goods. For customs clearance Australia services they do charge for the services they provide, the level of experience they have at customs clearing your cargo type can be the problem. While Customs brokers are licensed, so is that person in the car in front that cut you off yesterday ! You can't always get a good broker that is willing to hunt around for that Tarrif concession that can give you the edge in the market. You can apply for one yourself, or simply have us sort it out for you so you don't end up looking like this guy! Heavy Machinery Movers in Australia can be done using a combination of different methods depending on the region. 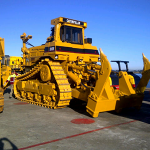 Kenter International Logistics has been shipping and transporting heavy machinery internationally for decades. 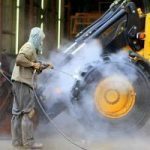 Experienced – Benefit to you is we can deploy a number of methods at any given time to suit your specific requirements and that of the heavy machinery cargo specifications. Word of Mouth 80% responsible for our growth – Benefit to you is people only refer service providers that will make them look good, we think the same way. We could ramble on about quick and cost effectively, innovative, extensive global network, professional, blah blah blah….just like every other website ! At the end of the day we are heavy machinery movers. We believe your our boss, we are accountable to you, you are paying us for all of the above in any standard transaction. Our difference – we hate stress. Our whole operations department is set up for stress free cargo management that you don’t need to be involved in – you just need to know its being done well. Dump trucks, Tracked Bulldozers, Crawler cranes, Excavators, Truck Cranes, Front Shovels, Industrial Machinery, Aircraft, Helicopters, Barges, Trucks, Tanks, Military Equipment, the list is endless! 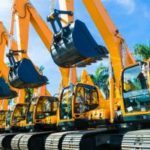 There are many components that need to be taken into account for all processes involving heavy machinery movers. Width, Height, Axle Loading are all vital information, and so is route planning. 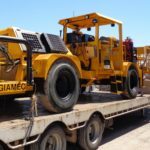 We work with many different heavy machinery movers for land based transport phases to transport machinery and heavy equipment around Australia and Internationally. 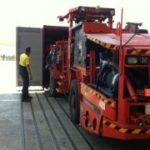 Over many years we have worked with different transport companies through a range of heavy machinery from relocating fleets of dump trucks through to the Kogan Creek Power plant Wharf to Site heavy haulage. We know which ones can get those last minute permits, and which ones work for a reasonable price to get great service levels. We don't believe in racing to the bottom for the cheapest price. We believe in getting your specialised heavy machinery moves done safely, stress free for a fair price. Sometimes we need to engage Crane Hire to assist in our role as heavy machinery movers. Franna Crane Hire - generally good for 20mt lifts. Often articulated these can maneuver difficult areas with ease. 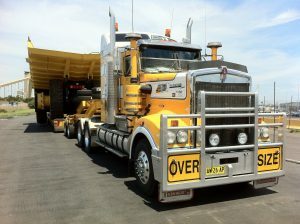 A really good all rounder for things like Blade packs onto flatbeds etc. If we need to lift Dump Trays up for some heavy machinery moves or drop some awkward cargo into a 40OT we have a solid work of suitable crane operators Australia wide. 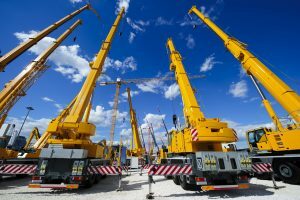 As costs are all pretty much an industry standard, the management of these services a strategic manner is the best way to manage your crane hire costs. With Safety Standards being paramount a Crane operator can only go as fast as safety will allow them too, the cost management comes with the aligning of all the service providers onsite in a stress free organised manner. Do I need an Oversize Overmass Permit? You will need to apply for a class 1 Oversize Overmass (OSOM) permit if your OSOM combination does not comply with a mass, dimension or operating requirements set by the transport roading authority in each state. For travel within ACT/Qld/SA—apply directly to the relevant state or territory road transport authority. For travel within NSW—apply to the NHVR or apply to Roads and Maritime Services for state-controlled roads and to individual councils for local government roads. For travel within Tas/Vic—apply to the NHVR. For cross-border travel—apply to the NHVR. Note: The NHVR processes all cross-border applications except for travel within the Northern Territory and Western Australia. For these jurisdictions, apply directly to the relevant state or territory road transport authority. But oversize permits don't just apply to the dimensions of the cargo loading on the truck, it also applies to the time of day we can complete heavy industry transport moves. For example due to public use requirements during the Christmas and Queens Birthday Long Weekend period's in Australia, there are road curfews in place where heavy machinery simply cannot and will not be allowed to be moved on the roads. You need to know cargo dimensions, be accurate with them and be organised well before this cargo needs to make or be removed from the wharf. 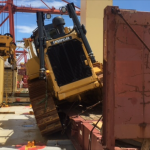 We can offer movement for heavy machinery movers from all Australian ports whether it is from the East Coast to West Coast, South Australia or the Northern Territory. We still need to co-ordinate road transport services to compliment the timing of vessels, but if you don't need the cargo there in 5 days time Coastal Shipping is much more cost efficient. 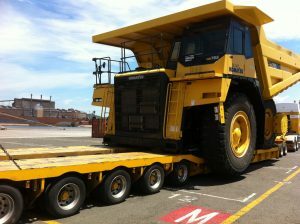 Depending on width and height dimensions, our options can also offer you heavy cargo moves by sea to and from Tasmania. Sometimes we leave it on the ferry with the same truck, sometimes we drive it on with one, unload it with another. In General we can deliver heavy cargo to wharf three (3) days prior to vessel coming alongside. On Project cargo we can hire a laydown area in regional ports to consolidate the heavy cargo, or strike a deal to have the port recieve the cargo earlier. On Import we have 3 days to remove the cargo from the wharf. If we dont we will aquire wharf storage per Revenue tonne, which is the shipping industries way of saying which ever measurement is the greatest is the one we are going to invoice you at. Due to terrorism and safety issues port access is becoming more and more difficult. You must pass a Australia Fedral Police Check when you apply for a MISC card, it is also only valid for 5 years. All operators must have one, along with completing a safety induction prior to accessing the wharf on foot or in a vehicle of any description. As barriers of entry get increased, the amount of transport operators who can access the wharf diminish. We work with them all the time and have done so over many years. 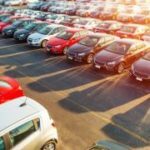 When you are planning on importing a car into Australia or car shipping overseas, you should be able to immediately trust the service that is provided by a vehicle import company. Car Shipping can give you a wider range of vehicles compared to the local market. If you’re looking at car shipping to Australia and New Zealand, or importing classic cars from UK and USA, we care here to help make it hassle free. Kenter International Logistics, with our leading knowledge car shipping and experience in global operations and local service, have a good reputation for trustworthiness and an impressive range of car shipping operations and warehousing facilities in Australia, and throughout the world. What is involved in car shipping overseas ? The regulations on importing and exporting cars into countries is different for each country. For example Australia has different design and safety standards than South Korea. The procedures for car shipping overseas however has a fairly standard process. The question of most importance from the start however is which method is the best choice. Some like the simplicity of Roro vehicle shipping, while geographically and speed wise it is sometimes better to choose loading vehicles into containers. Full Container Load- 20GP or 40HC to Ship a Car We would suggest this method for a faster transit time and if you wish to pick up a few extra items in the USA to ship a car. Transit times also are a lot quicker than some of the RoRo shipping companies to ship a car and depart on a weekly basis opposed to fortnightly and monthly. We suggest you refrain from shipping any food items, and ensure you keep all the receipts of your various purchases. Container shipping does offer good security of the vehicle, less possibility of damage occurring. We get a full receival report before you ship a car and photos taken of the vehicle when it is received at our loading facility, and at the unloading warehouse. Although they pack the car with care we are agents only so are not liable, this will ensure that we have the right documentation in place to assist you in any claim you may have on your marine insurance policy should you need it. Shared Container Shipping to Ship a Car Container shipping in a shared container is less expensive. The cargo will be consolidated at a facility, and while the cost is lower to ship a car, they do have to wait for enough cars and people who want to ship them before your gets on the water. In some instances this can take 6 weeks for them to even fill the container and you risk damage while it sits in their facility waiting to ship a car. Costs that will be included will be export and import customs clearance, local container transport, port terminal handling charges, quarantine and taxes, along with unloading warehouse facility fees. Roll On Roll Off Shipping Method to Ship a car Shipping a car roll on roll off method is a good alternative to Container shipping. 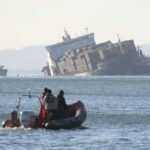 The Vehicles are driven on and driven off the vessel. Departure ports are limited so we need to look at the total cost to relocate your vehicle to the nearest departure port to weigh up if roro shipping your vehicle is the better option. Roro shipping trucks, roll on roll off shipping caravans or motorhomes, bulkier items such as boats on trailers. The cost of car shipping can vary according to various factors such as the model and make of your vehicle, your current location, the nearest departure/entry port overseas, your shipping method of choice, availability of your chosen services and your final destination. 3. Receive your Import Approval, make sure you review it because the Approval may contain conditions for use of the vehicle. 4. Arrange the Shipping. 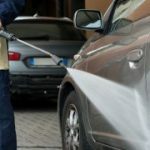 Prior to shipping, ensure car is steam cleaned inside and outside to remove any materials that may pose a quarantine risk, ensure any air-conditioning gas is removed, Arrange for asbestos testing and removal if necessary. 5. Complete Customs Clearance which will include lodging an import declaration, Paying Customs Duty and GST, and a Luxury Car Tax if required. 7. Meet and Pass Import Approval Conditions. Arrange for modification of vehicle if necessary, submit evidence of compliance. Russell imports a 1976 President studebaker in the 2016-17 income year. 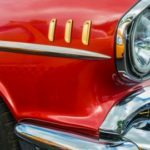 The customs value of the car is $90,000 before GST. It costs him an additional $2,500 (inclusive of GST) to have the vehicle imported into Australia. GST is added to the customs value of the car at the time of import. You must apply for and have received your Vehicle Import Approval (VIA) prior to shipping. 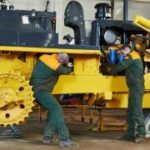 The Department of Infrastructure and Regional Development issues the VIA's that allows a road vehicle to be imported into Australia. Without it we can't clear customs and that can mean additional un-necessary storage and detention charges. To get a VIA, you need to apply under one of the Department of Infrastructure and Regional Development’s import options. 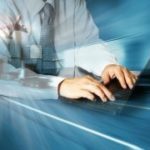 A completed application for a VIA, with all the necessary supporting documentation, will generally be assessed by the Department of Infrastructure and Regional Development within 20 working days of receipt. a road motor vehicle – a vehicle that is designed solely or principally for the transportation of people, animals or goods on public roads or a vehicle permitted to be used on public roads a road trailer – a vehicle without motive power designed for attachment to a road motor vehicle or a piece of machinery or equipment that is equipped with wheels and designed to be towed behind a road motor vehicle a partly completed road motor vehicle not a vehicle listed in a Determination under Section 5b of the Motor Vehicle Standards Act 1989 (MVSA). 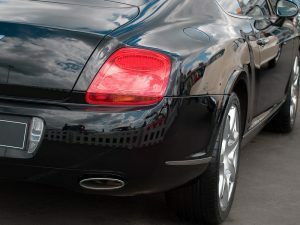 Used vehicles are subject to full external and internal inspection on arrival in Australia unless they have been processed by department approved offshore treatment providers. 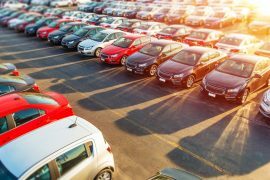 Used vehicles processed by approved offshore treatment providers are subject to a reduced level of inspection on arrival in Australia, as contamination issues should have already been addressed in the country of export. 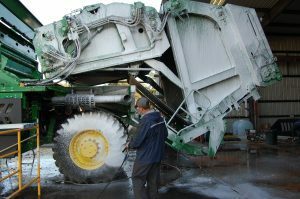 We have to ensure each vehicle is clean and free of contamination of biosecurity concern, internally and externally, before the vehicle arrives in Australia. 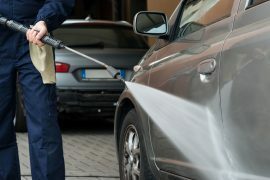 Before release from customs control, biosecurity Officers from the Department of Agriculture and Water Resources will inspect road vehicles for cleanliness on arrival in Australia. All inspection charges will be passed on at the final clearance stage. 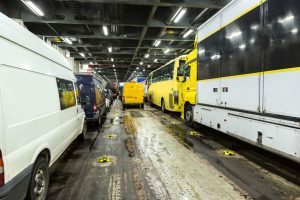 Whether you ship a Vehicle via Roll on Roll off or in a shipping container at the port of arrival we have to arrange a vehicle inspection on arrival. Documentation will be submitted as part of our customs brokerage services and we will request these well in advance of the vehicle arriving. Regarding Air-Conditioning in vehicles we need to meet the requirements of the Ozone Protection and Synthetic Greenhouse Gas managment act 1989. 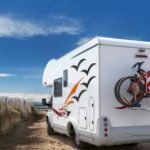 Any Vehicles, including caravans, construction and mining equipment that are equipped with an air-conditioner or a refrigeration system might require an import licence for ozone depleting substances (ODS) and synthetic greenhouse gases (SGG). We personal recommend simply degassing and then having the Aircon units re-gassed, it's a good opportunity to service the system at the same and make sure its blowing clean air at the same time. The Internal dimensions for container shipping vary, along with what weight can be loaded into them. Download our free Guide here ! Kenter International Logistics has container shipping options to many countries globally. FCL Container Shipping seafreight means you are not waiting on the LCL (Less than Container Load) container shipping service to fill up with other peoples cargo in a shared container before it ships. This gives you greater control over the delivery schedule with container shipping. The beauty of our service levels is that we let you focus on your day to day time management doing tasks that make you money, we keep your cargo container shipping moving globally. Kenter International Logistics offers a dedicated customer service manager to work with you directly on container shipping services. If you have more than 12 cbm of cargo its worthwhile considering Container Shipping your own gear. When you calculate all the warehousing and additional handling that a consolidator needs to cover in overheads it's simply cheaper to have timing controls in your own hands. Full Container Shipping Loads if they container new and un-used goods can o directly to your site for unloading. For example if you have a Container full of light weight plastics kayaks, it much more cost effective to have them come to site on a flatbed, unload straight from the container, good for your staff's health too- all that exercise ! Globally and geographically, container shipping steamship lines have an extensive network of routing options to get your cargo where you need it. Container Shipping Lines go to many ports that RoRo and Breakbulk carriers simply do not. RoRo Carriers were designed to transport primarily vehicles so they only generally attend major cities where car manufacturers have distribution centres. We work with a few different shipping lines that we believe give you the benefit of competitive pricing along with great schedule integrity, after all there is no point in saving USD 400 on a container shipping freight cost when it took an additional 30 days to arrive at destination port, meaning you just lost 30 days use of that vital piece of cargo! Just a Pallet of Hammers to move, need brand new machine attachment relocated ? When you only have a smaller item to ship, and its not urgent to get it to the final destination then container shipping s worthwhile considering. By consolidating your cargo with someone else’s cargo can often be a very cost effective solution for something under 5 cbm. We can pick it from the Origin and deliver it to your door with our LCL Container Shipping services. We then pack at one of our consolidators warehouses, so you can rest assured your cargo is in a secure customs bonded facility while it waits to ship. Depending on the port pairs, transit time can be anywhere between 2-8 weeks. It's important to find out exactly what the transit times are, I would hate for you to purchase a muscle car for your husband and have it stuck waiting in Los Angeles for a few more people to fill up the container before yours gets shipped and miss that special occasion. Ask for our regular LCL container shipping sailing schedules today. Packing and Lashing yards strategically placed around Australia. 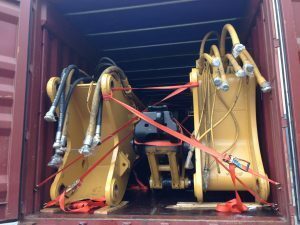 Depending on the type of cargo you want to pack into a container will depend on the Yard we use for container shipping, packing and lashing. Consolidation at Inland hubs for exporting no problem. 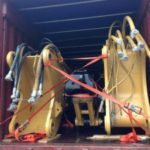 Due to the nature of the ocean and ships stability, the packing and lashing or securing of cargo for container shipping is critical to everyone’s safety. When considering container shipping we need to look at the overall cargo combination, shapes, sizes, structural strength, weight etc to make sure we can fit it in to maximise your value when container shipping. 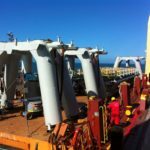 We also must make sure that when it is being loaded on a truck, through the wharf facility, on the ship, or when the doors are re-opened at destination that the cargo has not shifted in stow. This can cause a bad weight distribution, pallets to break apart, and wheeled units to smash doors open. We have reputable Packing facilities strategically placed around the USA, that can consolidate and secure your cargo safely. 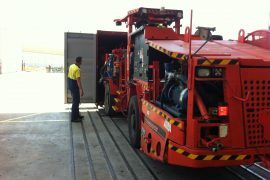 Kenter offer's our customers a seamless and efficient service of container transport in and out of Australia’s ports. Because we are constantly working closely with port companies, shipping lines and customs agents, we have created a stress-free efficient processing of paperwork and clear lines of communication to resolve issues if they arise. Having done this many times before we already know how to avoid the issues to best of anyone's ability in the first place, there is no need for us to be stressed out and incurring additional charges through being dis-interested in your cargo ! 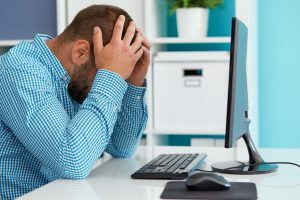 A major creating of stress in these current times can be the additional charges arising from the implementation of the Verified Gross Mass Weighing for SOLAS. 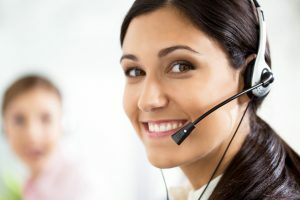 By managing and clearly communicating with all the parties involved this actually can be a very seamless straight forward process. We know which container transport companies are interested in long term relationships taking the good with the bad and which ones are out to make as much money off you as possible regardless of their flash website! With the Supply chain legislation and trucking laws the weight limit for a 40ft container shipping on a road in the USA is different from the road transport weight limit for a 40ft container shipping in Australia, things like this need to be considered right at the start when we look at what cargo you need to move and how we should best do it. When Importing to Australia we always ensure atleast 10 days prior to container arrival the appropriate documentation is at hand. We are happy to liase with your supplier on your behalf so we get exactly what you need to import your container shipping seamlessly. We believe there is no point in being stressed out going back and forth trying to figure out what documents you need - when we can just ask for you ! This allows us to ensure you follow the correct importing procedures and because our systems are electronically linked to the Australian Customs Service,the Australian Quarantine Service and other government departments it's really smooth. The documents that you will need for exporting will vary depending on which country you are exporting to, and how you are transporting the cargo. 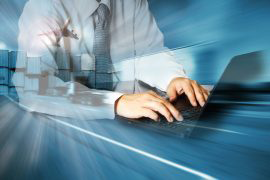 It is important to investigate which export documents apply to your business. To complete the clearance process shipping documents are required, the type of documents needed for importing or exporting transactions usually depend on the type of goods you have. In many cases, the documentation may also vary depending on the country of origin or destination. Thus, documents may have to be prepared in a particular way to comply with the requirements of the import or export country. 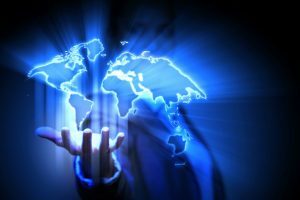 As a rule of thumb, a standard importing or exporting transaction usually requires a standard set of documents, plus the odd random destination country specialty. Give us a go, you've got nothing to loose, except the gray hairs and wasted time you've already spent trying to research it yourself. 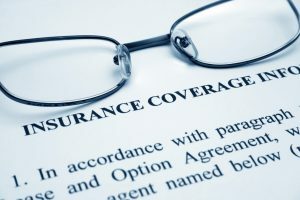 Prior to making your marine cargo insurance decision, Kenter International Logistics would like you to read the following information which summarizes your option to insure your goods and protect your financial interests or what your recovery options may be in the event of loss when based solely upon liability limitations within the transportation supply chain. If you already shipped your items! Yes, we can cover shipments already in transit! 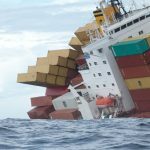 We work with leading marine cargo insurance brokers with coverage worldwide, so we also know which ones dodge it every way they can when you actually need to make a claim! The best way to protect your financial interests in your cargo is to purchase all-risk insurance. This marine cargo insurance and coverage relieves you of financial exposure from physical loss or damage to your goods in transit. 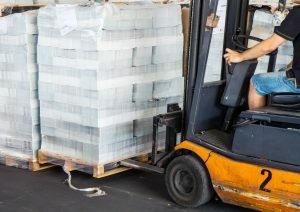 It basically insures the cargo against all risks of physical loss or damage from external causes subject to specific policy terms, conditions and exclusions. This coverage applies to ocean, air and truck shipments. Shippers are often unaware of carrier’s limits in paying for claims for loss or damage to goods in transit. Law or tariff restrictions limit the liability of most carriers and the amount recoverable is usually much less than the actual claim amount (see below). 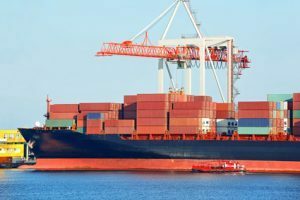 Under certain marine cargo insurance policies because carriers are not responsible for losses which are beyond their control including Acts of God, it is really important on high value or time sensitive cargo to review your marine cargo insurance coverage options annually. 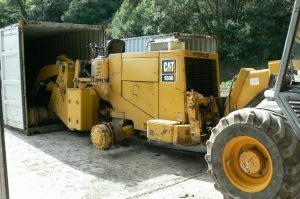 If you are Importing or Exporting Used Machinery there will be water involved. I have witnessed many knuckles draggers out there with hoses using water where they shouldn't be. Yes EPA Wash Pads do put water into fire suppression boxes, yes the EPA department will re-export your Cargo if they think contamination is severe, yes you have no form of re-course unless you have Marine Cargo Insurance. Recently I had a conversation with a new client regarding their Annual Policy. It was taken out with their previous freight forwarder. We asked for a copy to save on file against their customer card in the event we should need it, so they duly emailed me the quote. They had paid in full USD 4500 for annual cover to the Insurance Broker. We asked if we could communicate with the broker directly to ensure we weren't wasting time and the client had adequate cover for the shipment we were about to undertake. Guess What ? NO POLICY HAD BEEN ISSUED. The Insurance Broker took the money and never took out the policy. On further investigation to this company turns out he does it all the time, in the event there is reason to claim he gets his daughter who works for an underwriter to miraculously back date a policy ! Moral of the story - know what you need to ask for and only deal with reputable companies. In general taking a policy out on a per shipment basis is simple and easy. 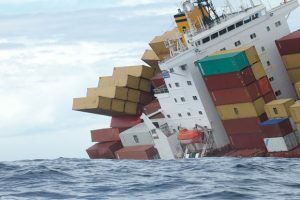 If your shipment is already underway and you have forgotten we can still take out Marine Insurance. For a rough idea of rates the following steps need to be applied. 1) Determine Your Insurance Value. This is either the total replacement cost value of your shipment or goods or Invoice value. You may include freight shipping or moving costs. Details we generally need are as simple as what Incoterms have you purchased the goods under, so we can determine where your responsibility starts and finishes. And what is the value of goods. This will determine the premium. From there we can discuss deductibles, on deck stow, countries your shipping between etc and come up with the rate. Just get in touch today and we should have it sorted for you in less than half an hour. Imagine losing $1500 per day in Dry Hire opportunity because your used machinery cleaning wasn’t washed enough at Origin port. Now it has to be tarped on arrival and spend 5 days and thousands of extra dollars in a Quarantine Washpad. 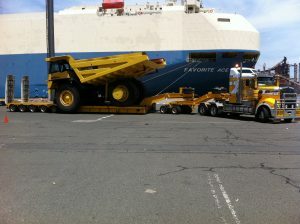 Or worse still, the Australian Quaranntine has ordered your container of machines for destruction or re-export ! Kenter’s Clients globally know they can count on us to clear their cargo quickly, reducing delivery delays and equipment downtime. Our network of cleaning facilities and trained personnel ensures that your cargo complies with New Zealand, Australian and USA environmental entry standards. All our facilities are trained but if the margins are too slim to pay a professional washer – simply Download the Cleaning Guides Below, Get Cracking, and when you think you have it clean enough ask Kenter to come and pre-inspect. Kenter has a quarantine cleaning service that others benchmark against, for both imports and exports with strict adherence to international standards. As part of the international shipping process across borders we offer solid quarantine management services to all of our clients. We have designed our quarantine clearance processes to specifically minimize delays and equipment downtime, and costs associated with importing nominated risk cargo. The quarantine management flows seamlessly when used in conjunction with our customs brokerage and clearance. Depending on your requirements, we can either manage the entire quarantine process for you or we can act in a supervisory role. Kenter offers management of quarantine inspections, preparation and packing we can provide pre-shipment advice and management of the landing process. Over the years we have provided many offshore facilities and their staff with quarantine management education programs, and set up fail safe systems for high volume importers. It's not rocket science, there is alot of literature on the processes, save yourself sometime and let us condense the answers. 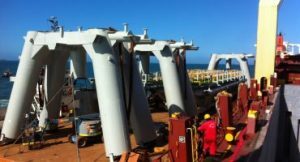 We work with facilities around all major Australian Ports. Quarantine standards isn't just unique to Australia. Most strong economic regions have environmental protection agencies for managing border entry to their countries.For example to Ship a machine via Roro it must be clean of any quarantine risk material externally. How clean is this exactly, how many hours should I pay for, who offers these kinds of services or should I attempt it myself ? These are all common questions we come across on a regular basis, the answers are dependent on many factors and much easier for us to suggest the right solution after a quick chat. There's no pressure, we're here to help you get it right as we know how costly it can be when you get it wrong. 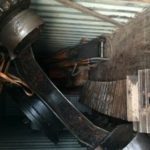 We have seen whole containers re-exported out of the USA with thousands of dollars of storage because the machinery wasn't cleaned properly. Its just not worth taking a punt. Make sure you check if you need an import permit before shipping goods to Australia. The Australian Quarantine department has a very user friendly search facility for import conditions in BICON. All packing materials used for bracing used machinery or new equipment in containers are subject to entry based on also being free of all quarantine risk material. Based on the paperwork from the shipper, a container sometime has to be directed to an AQIS approved premises for unpacking and inspection, delays will occur and costs will be involved. To minimise the cleaning costs we need to ensure the container is free of contamination from all quarantine risk material such as soil and plant matter. 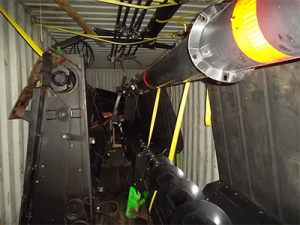 The inside and outside of the container should be cleaned before shipment to help facilitate clearance on arrival in Australia. Regarding Bracing, dunnage and pallets its best to avoid them all together where possible, however if you have to use this material try and and treat the container prior to arrival with one of Australian Quarantine approved methods. Alternatively use ISPM 15. Alternatively plastics, metal, or chains are a good idea. We all know that Australian wages and safety standards can add significant costs to importing where quarantine is concerned, but we also need to ensure we do everything possible to protect our local economy. 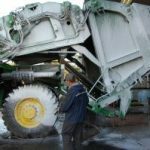 Over the years we have spent significant time off-shore training our overseas depots in Australia Cleanliness requirements on Used machinery, cargo and equipment, big and small. Labour costs are generally less expensive, and it can save significant transport, repanelling and washing costs. We have extensive cleaning checklists, documentation, and an extensive library of images to help identify areas of concern. It's certainly worth a conversation before you purchase CIF. A hassle free shipping process makes all the difference when you are purchasing from Machinery Auctions. It is extremely important the shipping and logistics provider you nominate is familiar with the documentation and legal requirements auctions must meet when exporting. Kenter International Logistics have shipped large volumes of cargo from machinery auctions located in all continents of the world. Just as you will read on nearly every other machinery auction freight forwarders page…..we too have a network just like them. The only differentiation is we place all of our focus on communicating efficiently and getting the job done without your heart skipping a beat. WHAT MACHINERY AUCTIONS DO WE SHIP FROM? Pre-Purchase Inspections, Live Bidding Auctions Services, Tax advice for overseas buyers, Documentation Management, are all important processes that should be taken into consideration. It is important to get an independent evaluation of the machine so that you pay a fair and reasonable price for the machine before you bid. Dismantling Services and Containerization to reduce your shipping costs. 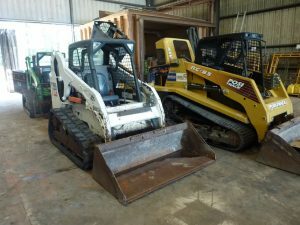 At many of the machinery Auction sites we have machinery dismantling services already available onsite, however in some cases you may have purchased the Machinery online and it is located in a remote location, we have strategically placed yards just for these occasions too ! And of Course Shipping so hassle free, you'll forget it was even underway because you will know at every step whats happening to your cargo it will be one less thing to wake you up at 1.30am because you forgot to follow up your freight forwarder !! Kenter has a vast network of agents globally that can handle and provide solutions for both rolling and static cargo. Roll on Roll off shipping often has maffi trailers which are basically big Flat Racks on Wheels that are towable. 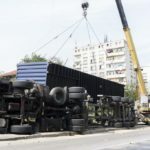 One of the timing issues we need to work with clients on is ensuring the availability of those trailers at the port of exit on time, which can involve re-positioning. Complete visibility and clear lines of communication helps us avoid costly delays on getting the equipment to work. From Off Road Heavy Dump Trucks to Conveyor Belt Systems, Roll on Roll off Shipping can be a flexible seamless option with reduced liability through un-necessary additional handling. Once the cargo is on board, its on board. There is no risk off the Track Frame Slipping over the side off Japan in high rough seas enroute. Worldwide, the mining industry has had to navigate high cost pressure in a declining commodity price market. 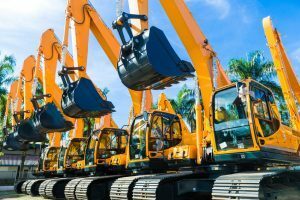 For many companies the best option has been to utilize their existing assets globally and relocate the equipment to areas of high demand and new emerging markets. Kenter works with you to determine the best routing, with independent storage yards and mechanics strategically located at all major transship ports. 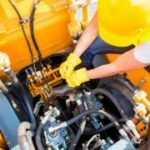 You don't need to worry about your cargo being delayed due to the Roro Shipping Line leaving the isolator switch on and draining the battery because we can have our independent mechanic whip the dead battery out and replace it to keep the cargo moving. Ultimately the choices you get to weigh up are lost dry hire revenue or USD 200 for a new battery and get the machine mobilized on site. Get in touch before the Auction. Use our enquiry form to contact us about your project. Receive and Review our recommendation and proposal. Bid and Win, Pay for the Equipment, Forward Us the Commercial Invoice. Scheduling. We check cargo readiness, vessel availability and book space. Origin preparation of Cargo. We collate the export documents and schedule the various processes to get your cargo to port. Shipping begins! Our team of freight managers track your project. Collation and editing. Documents are collated and checked for inaccuracies with a careful eye. Draft approval. Ensuring all documents meet the destination port requirements we run this past our destination freight office. Revisions. If needed, you may request two rounds of revisions within 2 days. We’ll happily make any required changes at no additional cost. Payment. Your Freight and Disbursement Invoices are issued within 5 days of vessel sailing, you release the funds and we pay out the various service providers and shipping line we have worked with along the way. Complete! Shipping Documents and cargo are released on time and cargo delivered to the client. Ask yourself, Do I really need to spend my day looking like this poor guy, or can I just hand one invoice to Kenter International Logistics and get it done ? When organising Container Cartage you must work closely with shipping lines, port companies, customs, quarantine and terminal operators. Kenter organises our customers a seamless and efficient container cartage service in and out of Australia’s ports. 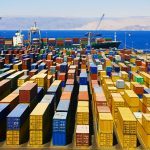 You need to communicate with so many different parties that can include shipping lines, customs brokers, customs, quarantine, the consignee, the unpack depot, the stevedores, the empty container parks and the container cartage company themselves to move the Container efficiently, you only get 3 days on the port free time. Some container cartage operators are able to pick up your containers from the container terminal at night or on the weekend, and may combine this with staging. This can help avoid issues with heavy competition during peak day periods for container cartage. It may result in VBS slots not being available at the desired time, and create delays occurring in the container terminal and additional costs to importers. Each of our operations team is have tried a number of different providers, we know which ones to call for which type of container cartage service. A major component that you need in container cartage is efficient processing of paperwork and clear lines of communication to resolve customs issues if they arise. Before Bills of Lading are handed to shipping lines, or submitted to Customs and Department of Agriculture (DAFF) as part of the clearance process, importers must ensure B/Ls are: accurate and contain all required information endorsed correctly (company stamp and signature) by the appropriate party/parties before being given to a broker. Ensure the container is not contaminated by soil and extraneous plant or animal material. Arrange for the inside and outside of the container to be cleaned before shipment. Ensure containers that contain timber, including exposed timber components, pallets and packing material have been treated (i.e. fumigated/treated in accordance with DAFF requirements). Provide DAFF with a packing declaration which includes a container cleanliness statement. Importers must get the correct commercial documents and information (B/L and packing declaration) to their customs broker/freight forwarder at least 5 days prior to the vessel berthing at the first Australian port. Benefits: allows time required for Customs and DAFF clearances enables a VBS slot to be booked by the transport operator before the vessel arrives, which should assist in timely delivery to the importer premises (if container not held for other reasons) enables the container terminal to plan deliveries, make better use of terminal space, reduce truck turn times and provide greater opportunities for bulk deliveries. WHAT HAPPENS IF I DONT HAVE IT ALLL SORTED? which will in turn delay both the booking of VBS slots, and containers being picked up at the container terminals. Greater risk of delivery delays, storage charges and the imposition of penalties for cancelled VBS slots and missed VBS slots. An overall inefficient sea freight supply chain, which affects all parties. Delays to Customs and DAFF clearances. If we don't have the documents in order and pay the Wharf charges in a timely manner it will mean Delivery Orders will not be provided. We may not be able to book a time with the Terminal operator to collect the container which means Container collection may be delayed as containers will be held. Container terminal storage charges may be incurred. For Import Containers you must Obtain Delivery Orders (D/Os), whether in paper or electronic form, from the shipping lines. Provided to transport operators at least 3 days before the scheduled pick-up day signed if required by Customs accompanied by a Quarantine Direction. Note that container information may be provided to transport operators as soon as possible to allow for pre-planning. The transport operator needs the container number and gross weight of the container before a VBS slot can be booked. 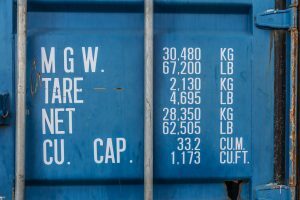 For Export Containers being delivered to the wharf a Container Weight Declaration must state gross weight (net plus tare) on all loaded containers. 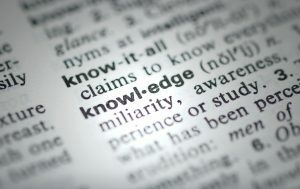 Include it in the Pre Recieval Advice (PRA). The Verified Gross Mass must be entered and included in the PRA message sent to the Container terminal prior to delivering the export container. Container Cartage Companies require a Clear Message to be received, any delays in submitting this paperwork results in truck wait time which they will charge you for. Expanded CoR legislation (see Chain of Responsibility section) introduces a new term and new provisions for a Container Weight Declaration, which must be completed whenever a container moves by road (including rail).A CWD complies with legislation if it contains the following information: the weight of the freight container and its contents (gross weight) the number and other particulars of the freight container necessary to identify the container the name, home or business address in Australia of the ‘responsible entity’, and the date of the declaration. WHAT DO I DO WITH THE CONTAINER WHEN IT'S EMPTY? Managing empty import containers (for dehire) Return dehire containers within the timeframe imposed by the shipping line (free time) which is generally 10 days from time of discharge from the vessel, some more, some less. The timeframe and costs between shipping lines varies. Most transport operators require 72 hours’ notification from importers that containers have been unpacked and are empty and available for collection and dehire. This ensures transport operators have sufficient time to book a Container Chain notification at the ECP and allocate resources to collect the container. Ensure the container is unpacked, accessible and the transport operator is notified of the correct container number. If required, ensure a hard copy of the EIDO or equipment exchange receipt is provided to the transport operators for returning the empty container to the ECP. Check that all documentation (D/O, handover certificate and copy of the EIDO) is accurate. You need to ensure all dehire containers are completely empty, i.e. 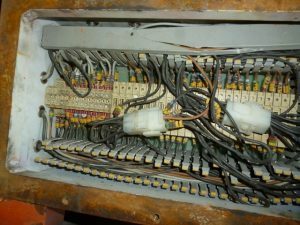 dunnage and any internal packaging have been removed. Providing the wrong container number may cause delays as many ECPs operate under the pretext ‘no paperwork =no service’. The ECP will either send the truck away or waste time trying to get accurate information from the shipping line, importer or freight forwarder. Delays in return of Empty Containers mean a detention cost will likely be imposed by the shipping line on the importer. Container collection may be delayed and will take up space in importer premises It could restrict transport operator access to importer premises for the delivery of other containers. This may result in a futile trip charge. 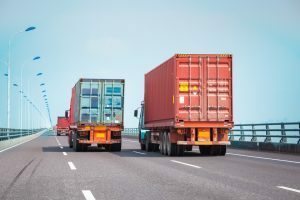 Providing the wrong container number can cause transport operators to lose their notification, not be serviced and may result in a futile trip charge; costs may be passed on to the importer. During Peak seasons if everyone delays the return of empty containers back to the container parks it potentially means a shortage of containers for exporters. 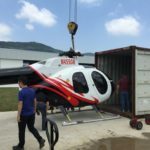 the contents will be passed on to the shipping line, which will recover the cost from the consignee. The risk associated with foreign currency exchange occurs on a daily basis. Your performance or position can be strongly and quickly effected by a move either way in currency exchange shifts. When you are dealing in more than one currency the risks grow. Get in touch to see how we can help through leveraging our high volumes currency exchanges with our Foreign Currency Exchange Assistance. 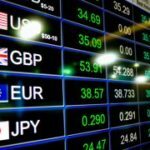 WHAT ARE CURRENCY EXCHANGE FLUCTUATIONS? Whenever the values of either currencies change that creates fluctuations. When demand is greater for one currency the value of that currency will increase. In general, the higher a country's interest rates, the greater will be the demand for that currency. Interest rate adjustments are used by central banks to influence demand for currencies. This is called Speculative demand. A speculator may buy a currency if the interest rate or return is high enough. 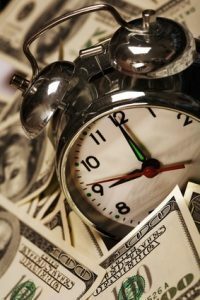 Foreign Exchange Assistance needn't have a large impact on your trade if managed properly. 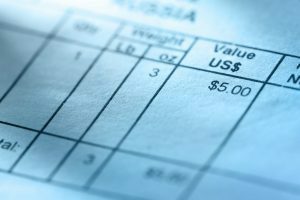 WHY IS FREIGHT GENERALLY INVOICED IN USD? Shipping goods and cargo from one economic market to another can be severely impacted by currency fluctuations. Due to the long transit times at sea, payment to your freight broker or logistics company can be managed by either setting a USD Account aside and having a balance that you use, then only buying USD when its favorable, alternatively you can hedge and book funds on a forward contract at an agreed rate with your banking facility or Forex broker. Its a good idea to familiarize yourself with the currency exchange terminology so you know what your asking for, it also shows your not a complete rookie ! Six Weeks is a long time to float around in the world of Currencies. You will generally always be quoted and invoiced in USD for the Ocean Freight and Origin Charges. This is generally because this is the most common currency to trade in, however sometimes it is more beneficial to trade directly in the local currency for Origin charges but pay the freight in USD. The shipping line may have set a better exchange rate at the start of thier voyage so It always pays to check at time of arrival of your goods. What strategy do you have in place to maximise your margin ? First of all you need to know what the Broker is referring to until you get the hang of it. Exercise Price - also referred to as strike price , it is the price at which the dealer will purchase a foreign currency option. Options - your foreign currency insurance, if the rate moves adversely for the purchaser, you can exercise the option. If it moves favorably for you, you can abandon the option and take advantage of the better rate. Spot Rate - you accept the rate offered and deal it no more than 2 business days later. We trade in large volumes of Currency on a daily basis. Because of this we often have better rates than the Banks will offer singular one off traders buying the occasional machine or items. Contact our sales team to see what rate we can get for you today, it's often worth the question. 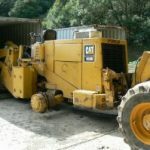 There are many companies that offer the services to dismantle equipment and pack, they often claim to specialise in dismantling and containerizing heavy equipment; Construction, Manufactured and Industrial (of all Makes and Models), and packing of all sorts of miscellaneous small items. Many of them will refuse to lash the cargo into place claiming there is a liability issue which leaves you with a machine in a container, NOT LASHED !! This puts you ate risk as the shipper or the consignee. If cargo shifts in stow, given the weight of machinery – it could kill someone. On Arrival to Australia depending on the Cargo type, sometimes the container will need to be unpacked at a Quarantine Approved Premise, possibly fumigated, Un-packed, Cargo inspection, and further treatment such as steam cleaning for used machinery maybe directed by Australian Quarantine Officers. Some cargo can be really workable to purchase and re-sell in your local market. Australia's landmass is huge and not densely populated. This often means we are quite happy to travel 60 minutes just to have coffee with a friend. We do have to re-locate machinery to the major centers for shipping, including dismantle and packing. 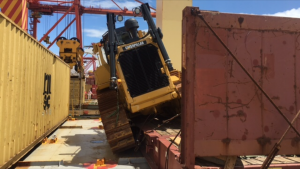 We have specialised Yards in every main port within Australia with port access, but it pays to price the process before you pay any money over for the purchase. 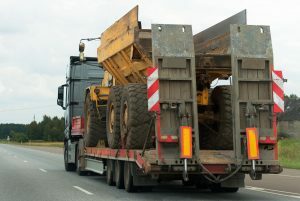 Of course there are weight limitations to what we can transport on the roads so easiest and simplest thing to do is tell us the machine, where is it located , and we can take a look for you. If your cargo is new and un-used and you have the appropriate evidence to show this, if you cargo is staying within city limits for un-pack, you can unpack the container yourself on site. You will have a couple of days to do this. If the container has new equipment but is being delivered to a rural destination, a tail gate will be required. This process involves quarantine inspecting the outside of the container and also opening the container doors. If there is any soil or plant material present they will order for further un-pack and treatment. Used high quarantine risk cargo will always be diverted to a quarantine approved premise. There are many yards that will give you a fixed price, but buyer beware when it arrives into their site and they have your cargo - they can change the price on you in an instance and hide behind quarantine for the increase. We only work with Un-pack yards we trust and have had extended relationships with for that exact reason. They are either in it for a quick buck, or they want to take the good with the bad for long term success. When you work with us, these relationships are our gift to you. Make sure gaps and packages are filled as much as possible. To calculate how much space you need for the cargo you will need to review container dimensions. Then calculate the footprint the cargo will make, and look at all the other pieces you may be able to load safely. 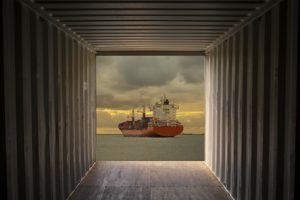 To secure the cargo shipping containers generally have lashing bars or bull rings in the floors, corner posts to shore with, along with side and front walls, however these are un-suitable for point loads. When choosing your materials, it pays to take into consideration the destination port rules and regulations for customs and quarantine entry. We cannot advise this aspect enough. 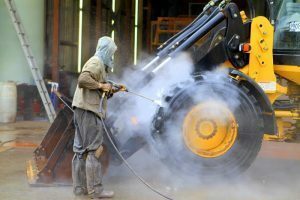 The costs involved with Australian rules and safety regulations, along with wages does not make any recovery exercise cheap. This often throw away little purchase will literally save you thousands of dollars. The price that can be added from spill trailers, cranes, surveys and repairs works just isn't worth the heartache for the relatively small investment.